Small Bird feeder Station Poles are more compact poles. 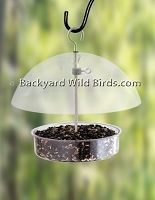 Pole kits can be for Hummingbirds feeders, Goldfinch feeders, Oriole feeders, or used on patios or decks. These compact special purpose poles are just the right size for their jobs. The Bird Feeder Station 4 Arm Pole is a perfect 6 ft Hummingbird Feeder Station pole that includes two Hummingbird feeders. The 4 arm pole is great as a Hummingbird feeder pole and has two extra arms to add your own. There are a variety of poles below that can have pole baffles and bird feeders for special purposes. Bird Feeder Station Pole kit is a medium duty 6 ft Bird feeder pole with 10" double hanger arms, single hook arm, water disk, and mesh feeder tray. Includes a full size 18" cone baffle to block squirrels. Bird Feeding Station Quad Kit is a decorative four way feeding station that you can use to hang your bird feeders, bird houses, planters, ornament, etc. The 6 ft pole station also comes with a dome squirrel baffle for the pole and two sets of stakes to anchor into the ground. The Squirrel Stopper Junior is a mid-sized pole that has 3 adjustable hanging arm stations and squirrel stopper baffle. The Squirrel Stopper Junior pole is somewhat smaller than the Pro version and uses 1 1/4 inch steel black powder coated pole tubes and a smaller Squirrel Stopper baffle.